READY TO CELEBRATE AMERICA? THIS WEEKEND’S HONOR AMERICA PROMISES GREAT ENTERTAINMENT, KIDS ACTIVITIES, PATRIOTIC CONCERT AND FIREWORKS—ALL FOR FREE! Individuals interested in kicking off their Independence Day festivities a little early may be interested in attending Honor America at College of the Ozarks. 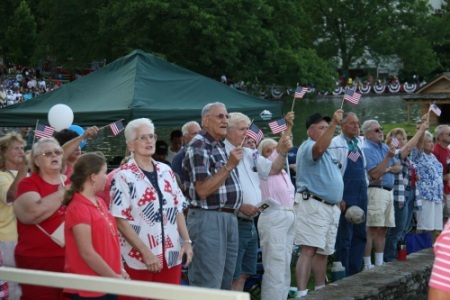 The old-fashioned patriotic celebration takes place this Sunday, June 26, and costs nothing to attend. It begins at 4:30 p.m. with a barbecue. Attendees may purchase barbecue items on site or bring their own picnics. There will be kids activities, including bubbles, tinker toys, face painting and more. The musical entertainment begins at 5 p.m. with The Petersens, who will perform a tribute to bluegrass and southern gospel. Branson’s Red, Hot…& Blue! will take attendees on a musical journey through the eras, performing 40s, 50s, 60s and 70s tunes beginning at 6:30 p.m.
A special patriotic program will begin at 8 p.m., followed by a patriotic concert performed by Red, Hot…&Blue!. The evening will conclude with a fireworks display. The public is invited to attend, and admission and parking are free. Honor America takes place on the College of the Ozarks campus at Lake Honor lawn. Lawn chairs and/or blankets are encouraged. Tobacco, alcohol, pets and fireworks are prohibited. For information, please contact the Public Relations Office at (417) 690-2212.